Normally, when my mom goes through airport security, she gets pulled out of line and searched. She’s never had a traffic ticket, much less been a candidate for the no-fly list. Why the delay? She carries numerous batteries, cords, chargers and other addendums – usually wound in to a large bundle and stored in the middle of her carry-on. When I heard of wireless charging pads, I immediately thought of her. These pads aren’t quite wireless. Call them wire-less: less wires, not wire-free. They require a wall connection (hardly surprising) and various gadgets to convey the charge from pad to product. The big selling point of wireless charging pads is that you only need one charger–and its accessories–instead of one charger per item. Let’s take an example. The average family of four probably takes two cell phones and three mp3 players on vacation. Add in a portable gaming device, and that’s a total of six chargers. A single wireless charging pad could charge all of these devices, albeit in shifts. 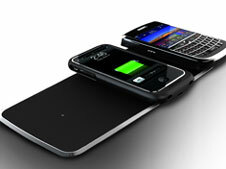 The clear leader in the small field of wireless charging solutions is Powermat. The company offers a tiny coaster-size one-device charger for $70 and a three-device mat for $100, which comes bundled with the Powercube Universal Receiver you need to attach or plug into your devices. The Powercube (a $30 option with the one-device charger)comes with eight tips for most Apple, BlackBerry, LG, HTC, Bluetooth, Palm, Nintendo, PlayStation, Sony, and Samsung devices. A car charger ($60) will be available in the fall. It takes about 2 hours to complete a charge, and the batteries seemed to hold their power like normal. However, you will need one Powercube or special charging case for each device, if you plan to charge them simultaneously—which can get pricey. The largely negative product reviews I saw on Amazon stem from this massive misunderstanding. Due to the advertising campaign, many people thought you could simply plunk down your device and it would absorb the charge. Other systems to consider include, Duracell’s myGrid Cell Phone Starter Kit ($90, with one receiver), which will charge up to four devices at one time and its charger tips work with miniUSB-powered and Nokia phones. You can also buy cases for Blackberry Pearl and Curve 8300 and Apple iPod Touch and iPhone. Plus Brookstone sells a case/charger combo, the PowerPlate Wireless Induction Charger for iPhone ($100). So is a wireless charging pad worth it? It depends on how many devices you and your family carry. Having a central charging point in your home that powers all your devices makes sense—no more searching for the correct cord. But keep in mind that the cases, do add weight, bulk and price to your devices. So for day to day use, it’s somewhat of a trade off. For travel, there are two things to consider. First, there’s outlet availability. I usually travel with a powerstrip that has integrated USB charging ports just in case. And then there’s total travel weight. You should literally weigh the wireless charger versus the power cables. IMO this is a very useless and expensive device. yes they help remove the clutter of the wires for your portable devices, but pay $100 for the pad, and extra $40 for ipod back case ? that is very expensive luxury which the average consumer does not need. thank you, but i will be keeping my “wired” chargers until this luxury costs $20 sub. I have a Powermat charger, with the Powercube, and I have to say I’m glad I bought it. Yes I was skeptical about whether or not at the current price it would be worth it, but I’m glad I made the decision to pick it up. The technology is new, and the price will no doubt drop in the future. I bought my Droid 3, and then my Droid 4, and cannot live without this feature. I havent had to plug my phone in in weeks. Just set it down, bam, charging. I bought the verizon one, but since it beeps, I bought the energizer version for work, so it doesn’t beep when I put it down, disturbing my coworkers. My son has an IPod Touch, 4th generation and it will no longer charge via the standard charger due to broken and bent prongs in the charging port. Will this product enable him to charge his iPod or does the Powercube have to plug in and attach to these broken and bent prongs? I would love to be able to salvage his current device and this is a much cheaper fix than buying a replacement!! I just came across your comment about your son’s iPod Touch and I wanted to just let you know that the products mentioned in this article are a bit outdated. 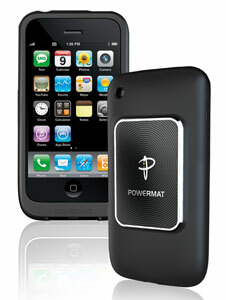 Powermat has since released newer items that would definitely be a great fit for your son’s iPod. Check out duracellpowermat.com and look into the iPhone 4/4S Batteries (because you need the correct 30-pin connector for the 4th generation iPod). If you get the Go Power Day Trip battery for iPhone 4/4S and a Powermat, your son has the ability to just drop the battery onto the charging mat and it will charge wirelessly. He can plug his iPod into the Day Trip battery while it’s on the mat and charge his iPod and the battery at the same time. Then, he can take the battery with him and use it as a backup portable battery. If you have a laptop or desktop computer at home, you can charge the portable Day Trip battery via the USB cable from a laptop or desktop computer as well. Thank you for your reply. I appreciate the help! Looking at the battery you recommended, doesn’t it still need to plug into the iPod’s charging port? The charging port is fully dysfunctional and won’t accept a charge by plugging anything into it. I was hoping there was a mat that could charge through the unit itself without plugging anything into the pronged charging port. I don’t know much about this so any advice is greatly appreciated! I’m sorry I misread your comment (I thought you were talking about the actual wall charger)! Unfortunately, even with the wireless Powermat (and with any charger as far as I know) you would need to plug it into the internal iPod’s charging port in order to get the device to charge up. If you’re positive that it’s the internal charging port within the iPod that is broken and not the charging cord then I would just suggest taking it to your Apple retailer or even an independent phone repair shop and seeing if they have any repair options for you at a low cost. Unfortunately a wireless charger isn’t an option for you. Wireless chargers plug into the existing charging port for the iPod touch. What do you think "wireless" means? I can never stop laughing at the people who call wireless phone chargers NOT or partially wireless because of the wire you plug into the AC outlet. Do you realize that by your definition we have NEVER and probably will never achieve wireless anything. What do you think is plugged in to your “wireless” router. An AC cord, and an Ethernet cord from the modem at the very least. Is your tv remote wireless? Not if you have to plug your tv in. The point of wireless is that the thing you handle (tv remote, ipad, phone, etc.) does not need any wires. PERIOD. Hey ya’ll Ive recently got a iphone 4. The charging port is messed up on it which is a simple $4 fix for the part on amazon. I have spoke to several retailers in the area who says itll cost easy 100$+ just to change the $4 part. I can use the apple charger into the iphone and it will not charge. if i get some sort of pad charger does it require plugging into the charging port and would it work like that? The charging mats require a case that plugs into the iPhone 4’s charging jack. So if that jack is broken, the charging mats won’t work either.